Of all the named ships of the Star Wars franchise one is universally known and beloved, the Millennium Falcon. Sure, the deeper one’s knowledge of Star Wars goes, the more you recall Slave I, Tantive IV, or the Executor, but the Falcon clearly stands alone at the front of the galaxy’s ships. 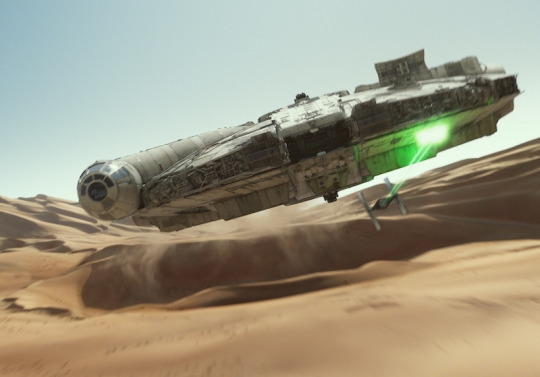 Why Han Solo’s ship holds this special place in our hearts seems immediately obvious, the Millennium Falcon is just dang cool. She’s fast, nimble, and her iconic design is forever embedded in the nostalgia factories of our minds. Except, at a glance toward her original introduction, it’s hard to say this was the inevitable result. 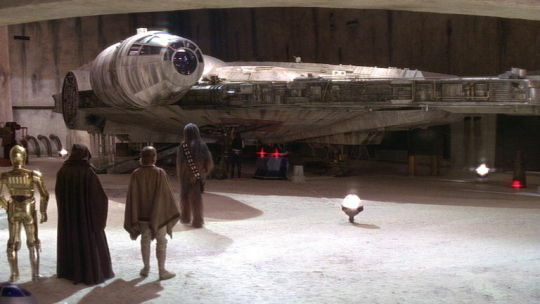 The Falcon was introduced by Han Solo in the Mos Eisley cantina, in his boasts of the ship’s Kessel Run record and in his shocked, almost disgusted, disbelief that neither Obi-Wan Kenobi nor Luke Skywalker had ever heard of the fastest ship in the galaxy. It was an ingenious build up for a joke that blossomed the moment Luke stepped into the landing bay and exclaimed, “What a piece of junk!” For a moment, the audience is forced to reconsider not just the Millennium Falcon, but also Han Solo’s character. If the Falcon is a piece of junk, as our point of view character has proclaimed, does that make Solo a liar? Can he be trusted? Unfortunately for the Millennium Falcon, her attributes which had been discussed by Han were simply not quite ready to be put on display by the special effects capabilities of A New Hope. 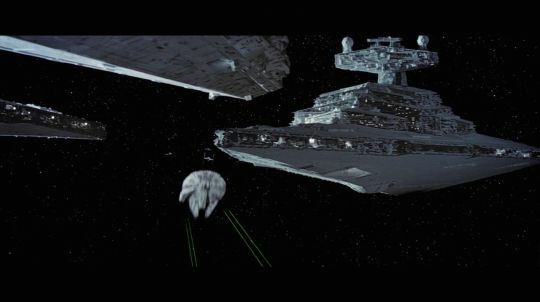 The most awkward moment for the Falcon arrives just after the ship has left the atmosphere of Tatooine and the heroes find the Empire and its fearsome star destroyers bearing down upon them. Han comforts his passengers with the statement that he knows a few maneuvers to shake the star destroyers, but his cockiness doesn’t translate back onto the screen. Instead, we are treated to an almost static shot of the Falcon flying in a straight path with the star destroyer behind her. It’s both before and after their visit to the Death star that the Millennium Falcon’s fabled abilities fail to match up to the script. In both instances Han references the speed of the Falcon against TIE fighters and both times there’s no visual reinforcement. Is it the Falcon’s fault? Not in the least, it’s world building and storytelling exceeding the technical limitations of the time. Even the Millennium Falcon’s surprise return during the Battle of Yavin heralded nothing new or exciting in space. Thankfully, we were then treated to The Empire Strikes Back. The Empire Strikes Back is credited as the Star Wars film which truly dug into the depths of its characters, developing the romance of Han and Leia, and exploring Luke Skywalker’s desire to become a Jedi like his father before him. Rarely said is the incredible job the film did to instill in the Falcon everything we believed about her, but had so far failed to see. From the moment the ship flees the fallen Hoth base, we finally appreciate the speed and maneuverability long promised, as the Millennium Falcon weaves through and around star destroyers and evades asteroids all the while being pursued by TIE fighters. It’s also in Empire that the Falcon develops into a ship we root for instead of simply a ship our heroes fly across the galaxy in. The sound of her hyperdrive failing pulls us into the cockpit with Han and Chewie, while both their interactions with the ship, trying to fix her and successfully fly her, helps creates a deeper bond for everyone. When Lando Calrissian is introduced, the Falcon’s value is emphasized by his own remarks about the ‘fastest hunk of junk in the galaxy.” In short, the condition of the Falcon, her well being, becomes part of the storytelling and concern for the fans. It’s also the only time in the film when we learn a little about the personality of her computers and references to “talk to the Falcon to find out what’s wrong…” which imbues a personhood to the ship. The film ends with Luke, Leia, and the droids watching the Corellian light freighter soar away from the medical frigate sans Han Solo. In a weird way, the continuation of the Falcon, even with Lando Calrissian in the pilot’s chair comforts the anxiety of a carbonite encased Han Solo on his unwilling and unconscious way back to the palace of Jabba the Hutt. 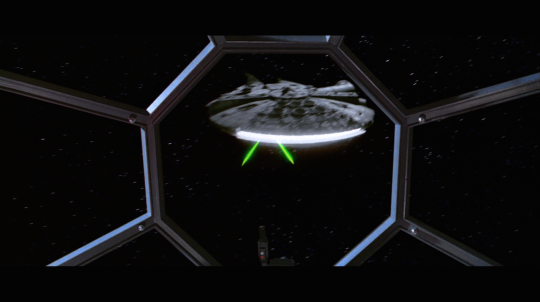 Return of the Jedi fails to feature the Millennium Falcon for the first third of the film, and then, only briefly shows the ship heading away from Tatooine to rejoin the rebel fleet. From there, it’s the last time we see Han Solo in her cockpit until The Force Awakens, decades later. While the Falcon takes a much more back seat role in Return of the Jedi, the script forces us to continue our concern and appreciation for her. Prior to the rebels trip to the forest moon, we are provided a poignant scene involving Han and Lando with the Falcon sitting in the background. It’s Han trusting his ship with Lando, pointing out she’s the fastest ship in the fleet and should be a part of the rebel attack on the Death Star. It’s a tense filled scene based on Han’s very apparent love for the Falcon, reinforced by a remark just a scene or two later concerning his fears he may never see her again. For the rest of the space battle scenes, we worry over her safety and marvel as she leads the Rebel Alliances’ fighters in a soaring attack on the Death Star. The look on Lando’s face when the Falcon’s dish antenna is clipped by construction inside the battle station was undoubtedly duplicated on every fan watching the scene for the very first time.